In addition to your home oral hygiene habits, the American Dental Association recommends that you visit your dentist twice a year for a cleaning and checkup. Unfortunately, the Centers for Disease Control and Prevention estimates that only 84% of children and 64% of adults scheduled an appointment last year. Often, it is believed that you only need to see your dentist after a problem develops; however, this is not true. Although you may want to avoid the costs of dental visits, regular services from your dentist are necessary to keep your teeth and gums healthy. By doing so, you will save money on your dental care. The foundation of dental care focuses on prevention. Not only are your home oral hygiene habits important for reducing your risk for tooth decay, gum disease, and other issues, but the services you receive from your dentist as well. Many tend to believe that routine appointments are a waste of money, but this is not true. They actually provide you with an opportunity to save money. In fact, Cigna reports that $8 to $50 are saved in restorative and emergency services for every $1 spent on preventive dentistry. Not only does prevention impact your dental costs, but your healthcare expenses as well. Often, preventable issues land many people in the emergency room each year. Unfortunately, most ERs cannot handle dental emergencies, like a broken tooth or an abscess. As a result, they often prescribe pain killers or antibiotics instead of treating the underlying issue. This causes 39% of patients to end up back in the ER. With your oral health directly linked to your general health, preventable problems like gum disease can further drive up your healthcare costs. Cigna reports that early periodontal care can reduce overall medical expenses significantly after just one year. 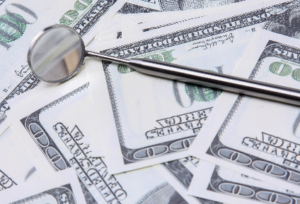 In fact, those who have diabetes can save over $1,400 when undergoing periodontal therapy early. Infrequent dental care also impacts your income. According to a Delta Dental Oral Health and Wellbeing Survey, one in six Americans miss work due to dental issues. This results in more than 165 million hours of lost income annually. Preventive care is designed to stop issues from developing in the first place. By monitoring your dental health, potential problems can be detected early for prompt intervention to prevent it from worsening. This lessens the need for a costly or invasive treatment in the future, unnecessary ER visits, and lost days from work. If you are worried about the cost of preventive services, you can see your dentist twice a year using your dental insurance. Most policies cover preventive appointments in full or for a small co-payment. If it has been more than 6 months since your last dental visit, contact your dentist today to schedule an appointment. Dr. Bradley Mitchell is committed to creating healthy, beautiful smiles. With a focus on prevention, he will help you achieve healthy teeth and gums to reduce your long-term costs for care. If you need a cleaning and checkup, contact Michell Smile Design today to schedule an appointment.